Steve Brooks of Trust Cellars is representative of what life is like for many of Washington State’s small wineries. More than three quarters of the state’s 670+ wineries are small producers like Trust making less than 4,000 cases annually. This preponderance of small wineries is a trademark of the state’s industry. By contrast, many wineries in other areas often make more cases of a single wine in their portfolio. Instead, numerous Washington wineries are mom and pop operations - or sometimes just mom or just pop. Winery ‘staff’ can often be counted not just on one hand but often one finger. Family, friends, and other volunteers are pulled in at critical times to assist. Life at a small winery requires always changing hats, from winemaker to janitor, to bookkeeper to marketeer. Additionally, it means lots of travel time. Even if a winery has as distributor, someone has to be out promoting the wines. At a small winery, the choices for whom will do this are few. So it is with Steve Brooks. Brooks moved to Walla Walla with his family in 2003. Prior to the move, he had been working for CNN in Atlanta for nineteen years before deciding to take the plunge into the world of wine. 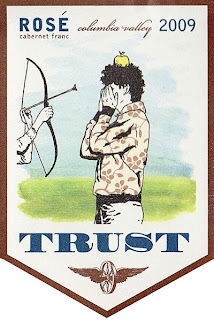 After taking classes at the Center for Enology and Viticulture in Walla Walla and assisting at several area wineries, Brooks launched Trust Cellars. Since that time the winery has distinguished itself with small production riesling, cabernet, syrah, and rose. Trust has flourished over the years with production at 2,500 cases and a wine club with a long waiting list. No wonder as the winery consistently provides both exceptional quality and value. The new releases, reviewed below, do not disappoint. Indeed, the 2009 Cabernet Franc Rose is the best the winery has made to date and is the perfect summer wine. Like many winemakers at Washington’s small wineries, Brooks is often on the move. Here’s a brief look at the last couple weeks in the life of Steve Brooks. July 15th was a winemaker dinner at June in Madrona. This was followed by a stop at West Seattle Cellars on July 17th to pour the winery’s new releases. Then back to Walla Walla…but not too long as Brooks was back in Seattle pouring at Poco Wine Room on the 22nd. August is much the same with visits to 106 Pine, Esquin, and the Sunset Supper at Pike Place Market. That’s a lot of frequent flier miles – on the car of course. The frequent travel between eastern Washington and the Seattle area is a familiar story for Washington winemakers. 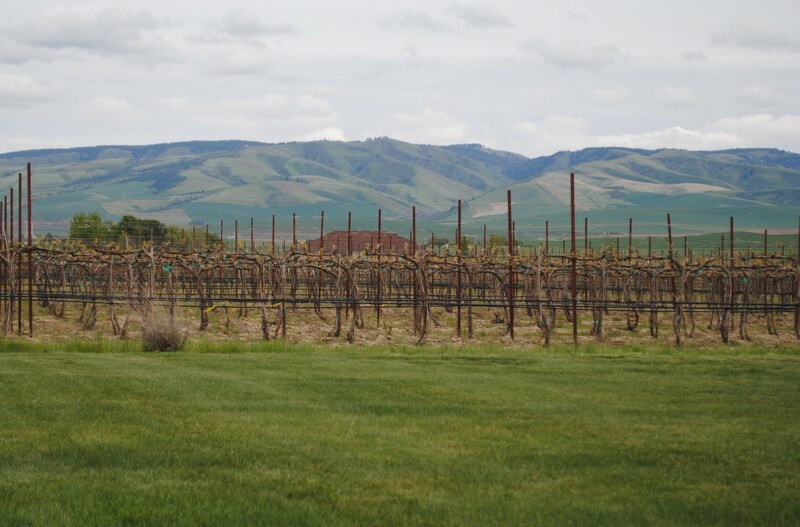 While the Walla Walla Valley has a flourishing wine tourism industry, it is still comparatively small. Thus wineries must seek out larger population centers where the consumers are. While Brooks is considering opening a Seattle-area tasting room as many wineries have in the last year, he’ll no doubt still be traveling across the state frequently and taking one hat off to put another one on. “Living the dream,” Brooks says sardonically. Rating: * (Excellent) Pale lemon yellow. An aromatic nose with mineral, fresh white grapefruit, lemon rind, and a touch of stone fruit. Tart and fresh on the palate with bright acidity and a just a hint of sweetness on the finish. 100% Riesling. 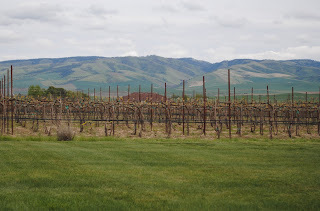 Pheasant, Hyatt, Wahluke Slope, Evergreen, and Ancient Lakes vineyards. 12.4% alcohol. 293 cases produced. Rating: * (Excellent) Pale pink with a tinge of orange. Nose is marked by wet stone, strawberries, and a touch of spice. Fresh, tart, and clean on a dry palate. Best rose from the winery yet. 100% Cabernet Franc. Bacchus (86%) and Black Rock vineyards. Fermented in neutral French oak. 13.2% alcohol. 187 cases produced. Rating: * (Excellent) Earth, light game, blueberries, and a touch of chocolate on a beautifully aromatic wine. Palate shows lots of berry and umami flavors with a perfect balance of acidity to hold it all together. 100% Syrah. Lewis, Portteus, and Sundance vineyards. Aged 16 months in French oak (25% new). 14.5% alcohol. 320 cases produced. Rating: ** (Exceptional) Dark purple in color, almost stains the glass. Bright blueberry aromas, violets, and touches of chocolate. Great intensity on the palate with silky fruit with grainy tannins and a slight citric note. Give one to two years. 100% Syrah. Les Collines, Old Stones, and Davidson vineyards. Aged in French oak 18% new). 13.8% alcohol. 272 cases produced. Rating: */** (Excellent/Exceptional) Starts out as a black licorice bomb along with pencil shavings and blackberries on a very aromatic nose. Big and rich on the palate with lots of fruit accented by chocolate flavors. 76.5% Cabernet, 12.5% Merlot, 11% Cabernet Franc. Phinny Hill, Bacchus, Kelly, Conner Lee, and Lewis vineyards. Aged in French oak (50% new). 14% alcohol. 369 cases produced. Red wines sampled at 67 degrees. Other wines at 59 degrees.